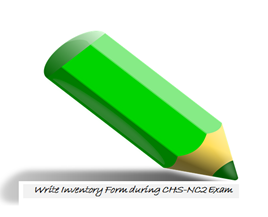 One of task perform during the NC2 exam is to write the Hardware Specifications of the computer that assign to you. Actually it is dismantled first before the exam will start. The writing of the hardware is not the critical aspects of the exam but it is recorded your performance how you write a certain specs of the computer. This is one of the forms that you need to write what are your stock knowledge as you learn during schooling, industry experience, and or during training. This is perform before the Q & E and before the hardware be assembled properly. And you need it to write very specific, easy to red, and do your effort not to erase and leave a scratch because it is your form that your accessory will get a performance and will decide that your competent of the disassemble and assemble personal computer. Remember this is only a guide a help to you to learn as we do our best to pass the exam, so do your best to study and familiarize and memorize the hardware and materials of the computer. Not only that, you need also to learn about the assessment center, including the working area where the exam perform. You need to familiarize the equipment use of that working area including the specs also, such as fire extinguisher. The very idea is to visit earlier the assessment center or visit it before the day of the exam. Just study the table below how I write the specs of the computer.